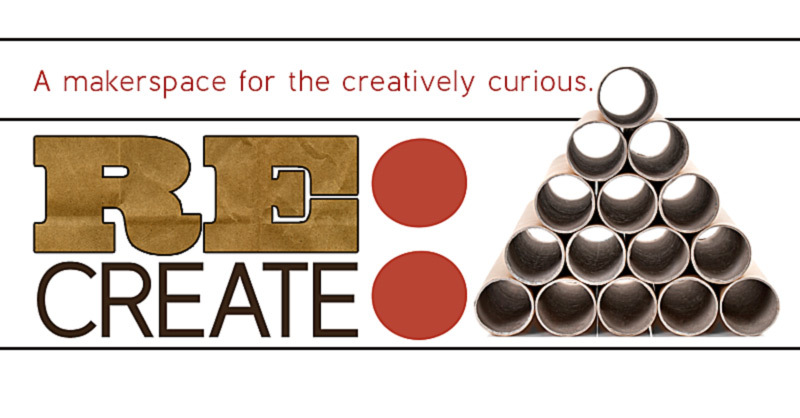 A makerspace for the creatively curious. We welcome the inquisitive, curious, skeptical, baffled, and creatively perplexed to be a part of this adventure with us. The theme of the space is making art from found objects so we’re not only making things, but we’re also bringing awareness to how much garbage is thrown out. There will be a Cardboard Chaos area for younger audiences (in age and at heart), as well as working space, conversation space, tools and items that can be used for exploring creativity and art-making. Everyone is invited to come and try weaving on our community loom. No weaving experience required. Bring your own materials or use the ones we have available. Flyers available in the Art Gallery OR download & print now. Partnering with our community’s own artists and crafters, each week will have a theme and suggested projects to get the conversation going. Saturday mornings will set a theme for the week and provide an opportunity for us to learn from our community artists, and engage in unexpected conversations, all through the process of exploring our creativity. Workshops take place Saturdays, 10 a.m. to 1 p.m., in the art gallery. Themes, workshops, and projects will range from bookmaking, earth totems, story writing, collage, fiber arts, found sound, experiential art, origami, theater, music, poetry, and more. No previous experience or skill is needed – only a willingness to participate. For scheduled workshops and events, sign-ups are appreciated (by calling the gallery at 605.642.7973 x0), but walk-ins are welcome. Art Happy Hour on Tuesday afternoons will provide a time for gathering, relaxing, connecting, and either working on a project or learning a bit more from one of our community artists. Come make a cork trivet, play with sounds, or learn about the art of storytelling. Art Happy Hours take place Tuesdays, 4:30-6 p.m., in the art gallery. 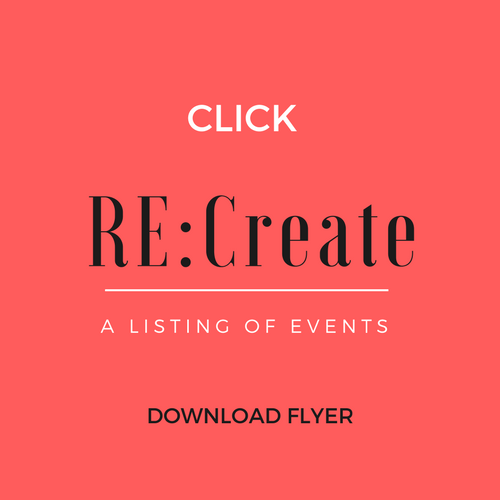 On Thursday mornings, bring that coffee shop conversation and your coffee friends – to RE:Create and see what happens when you explore creativity together. Some mornings will have suggested projects, a community artist available, or just relaxed time to come and explore. We are using found materials (cardboard, used plastics, used fabrics, found materials, unexpected objects, etc.) to engage with the community to create art and also to have conversations about sustainability, community, and rural connectedness. Together, we will explore, examine, engage, and discover. Coffee Talk & Tinker events take place Thursdays, 9:30-11 a.m., in the art gallery. Do you love the creativity of literature? Bring in or pick up a book from the free book exchange shelf. But instead of just dropping off a load of books, we ask that you fill out the provided book covers and share with the next reader what you loved about the book you are sharing. Pass along a bit about your experience with the book and help strengthen connections in our community. Book covers are available in the Gallery. Local author visits take place in the RE:Create makerspace from 12-1 p.m. every Tuesday and Friday, in the Feb. 3-Mar. 24 timeframe. Highlighting the many aspects of art in writing, during these lunch-hour discussions, the community is invited to visit with local authors, ask questions, and discuss books. Each author will make an informal presentation and discuss the topics that are of interest to the those in attendance. This is an incredible opportunity to meet the diverse range of authors in our community including those who focus on poetry, journalism, history, or fiction. We also invite you to use this time to visit the free book exchange and share your favorite book, with a recommendation. No previous skills or experience needed, but children must be supervised. This entry was posted	on Tuesday, December 19th, 2017 at 11:45 am	and is filed under Art Gallery Shows & Events, ArtCentral Projects, News & Blog, Outreach. You can follow any responses to this entry through the RSS 2.0 feed. Both comments and pings are currently closed.